ABI was first to develop several Robotic Integrated Solutions for the Food & Bakery Industry and is amongst the first in the Baking Industry to integrate vision guided robotics equipped with KMT waterjet cutting components. 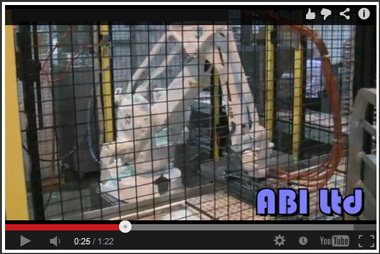 ABI has applied Robotics in all stages of the baked goods and food production. Today ABI continues to build on this success and we look forward to hearing about your application, chances are ABI may already have a solution. ABI is partnered with ABB, one of the world's largest robotic suppliers. ABI systems can incorporate cutting for many products including cinnamon rolls, bread, croissant, pastries, cakes, cookies, cereal product, french toast, waffles and more.